What is a tongue and groove ceiling? Usually ceilings are made from drywall screwed or nailed to ceiling joists and coated with a thin skim of plaster. Although this is fairly straightforward for a professional to do, for the average homeowner, it is a task way beyond the DIY capability. Wooden tongue and groove is a viable alternative whether it is an economy job using low grade softwood or a more up-market ceiling using high grade hardwood. The installation process is easier than drywall and the finished product gives you a lovely natural wood ceiling. Why would you fit one? Without a doubt, if you haven’t got any artificial aids, drywalling a ceiling is a two man job, and even if you have two men to do the job, it is still difficult and awkward to get the sheets in position. Standard 8ft x 4ft (2.4m x 1.2m) gypsum sheets are heavier than 52 lbs (23.6kg). The OSHA recommendations for the maximum weight to be lifted by one person at work is 50 lb and if you combine that with the fact that ceilings require boards to be lifted above the head you can understand why two people are recommended. Once the sheet has been lifted into place, had a few screws driven through and into the joists, it then becomes a less awkward task to finish off all the other screws. But that’s not all, you then have to tape the joints and skim some jointing compound across to seal the gaps. Finish off with a skim across the whole ceiling and you have completed the task. Job done! Hang on a bit, the trouble with drywall is that the slightest flaw in the jointing procedure will show and make what could have been a good job into a mediocre job. The answer is to cover the ceiling with wooden tongue and groove boards. Each board weighs a fraction of the weight of a drywall sheet and the tongue and groove will hold the board in place while you knock in a few nails to hold the length in place. Although it may take longer than with drywall, it is no problem to lift the lightweight lengths of wooden board and knock the tongue and groove together with a rubber mallet. You don’t have to do anything with the joints, the groove takes care of that and allows the wood to expand and contract without opening up the gap between adjacent boards. A completely dry construction project. Finally, all the surface needs is a quick sanding, followed by a few coats of paint or a couple of varnish. This sounds like a much easier job and is definitely a one man job as well. The benefits and problems of each type of ceiling compare well too. Let us just have a quick look at these and see which type of ceiling is the overall favourite. You can achieve an almost perfectly smooth and flat surface if done professionally. Attractive finish, gives a rustic or elegant atmosphere depending on the type of wood used. Easier to paint with latex emulsion paint and a roller than tongue and groove which will need an oil based paint and a brush. Easy to lift each board and nail into place. Traditional method used in many houses and will not attract undue attention to potential house buyers. The finish is more forgiving if the surface is less than perfect. Quickly covers ceiling. Can be used to disguise a poor condition ceiling. Almost impossible for one person to install. Awkward for two people. Harder to paint than drywall. Needs oil based paint and brush. Needs upside-down plaster skimming. Very difficult for DIY. 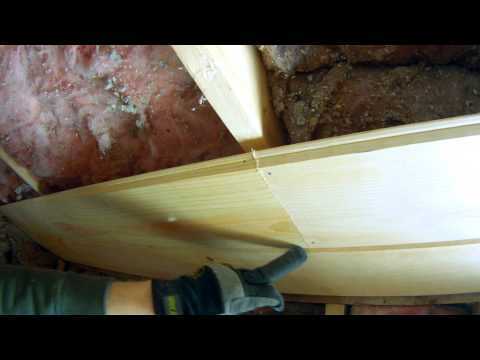 Acoustic insulation worse than drywall. Finished joints must be really good or else they will show up imperfections. Fire protection worse than drywall. Takes longer to cover ceiling. What materials do you need to do the job? Let us just assume for now that we intend to use ordinary softwood tongue and groove board with a width of 5.5 inches, thickness of about 0.75 inches and lengths of anything from 8ft to 12ft. Remember that we don’t want the long boards because they are better, because a very long board can be very difficult to handle. We want a long board so we can cut out small lengths that may have shakes or dead knots spoiling the grain. We will assume that the existing ceiling has no covering at the moment; it is just bare ceiling joists. If the ceiling was covered with plasterboard and the ceiling had a textured finish then it may be better to batten the ceiling with 2”x 1” tile batten or similar so that we have a level surface and know exactly where the tongue and groove can be fixed. Nailing the boards to the ceiling can become very tiring due to working above your head continually so it might be better to put aside your manual hammer and either buy or hire a nail gun to make light work of the nailing. Use a rubber mallet to gently tap the two boards together. Use an offcut of board. Slot the tongue of the offcut into the groove of the board you want to tap and gently tap the offcut with your hammer. You will find that the force is transferred directly to the full thickness of the board and bypasses the groove. As the offcut becomes damaged beyond repair you can simply use another offcut. Tapping a small nail at one end of the proposed straight line and loop the ring over the nail. Walk away from the nail, allowing the string to extend out of the container until you reach the other end of the proposed line. Pull the string taut between the two ends. Pull the string away from the surface as if you were plucking the string like a guitar string. Release the string so it returns to its original position and hits the surface. The chalk coating the string transfers onto the surface leaving a perfectly straight chalk line. You don’t need to draw along a straight edge with a pencil. The line is drawn in a fraction of a second. You can stand in one position and draw the line as long as you need. Because the mark is chalk it is easily removed from visible surfaces. It is a one person job. If you want to draw a horizontal line along a wall, you can hang a ‘line level’ onto the string to ensure the string is perfectly level before ‘twanging’ the string. How to install a tongue and groove wooden ceiling? In order to have an appreciation of how you go about installing tongue and groove boards, how long it takes and therefore what you will be paying a contractor to do, it would be worthwhile running through the steps required to complete the job. Before we start there are a few sensible rules you need to bear in mind when installing tongue and groove. If you don’t like rules then think of them as useful tips. ✓ Let us just remember that installing a tongue and groove ceiling is slow work and because you are working above your head, can be extremely tiring for your arms. Remember to take plenty of breaks and allow your arms to hang limply down at your sides when not being used. ✓ We will want to keep the lengths of board as long as possible. You must bear in mind however that there will be cut edges at either end of the length that will need to be supported. Always cut the board so that the end reaches half way across the width of a joist. ✓ Make sure you ‘stagger’ the cut ends. This means that you must not have two or more cut edges next to each other. This makes the jointing much stronger. ✓ Do not save up all the small cut lengths until the last couple of feet. Try to spread the small lengths randomly across the ceiling. ✓ Decide whether you intend nailing the boards using face nailing or blind nailing. Blind nailing is when you hide the nail within the groove and face nailing is when the nails are driven through the main body of the board. ✓ If you are using face nailing try to keep the nails in straight lines, following the joist. It looks much more attractive. ✓ When you start nailing the boards on the ceiling you will notice that very few of them are straight, they are almost all warped. This isn’t a problem as if you start nailing from one end you can gently straighten them as you move along the board and before you nail in place. ✓ When the boards reach the edge of the ceiling, don’t worry if there is a gap between the edge of the board and the wall. As long as the gap is less than 3/8” it can be covered by the trim which will be used to finish the edge. Now let us run through the steps one at a time and see how easy (or difficult) it is to install tongue and groove. Refer to the previous tips whenever necessary. ✓ Using the chalk line (see in a previous section how to use this), mark a line the width of the board away from the ceiling’s edge. ✓ Choose a long board and nail it in place, making sure the grooved edge is against the ceiling edge. Straighten the board so it follows the chalk mark as you work along it. ✓ Continue adding boards and nailing them in place until you are at the joist nearest to the edge of the ceiling. ✓ Cut a short board to fit into the remaining gap and nail in place. ✓ Stay at that end of the room and nail a long piece to the ceiling joists so it runs past the short board. You may have to gently tap the board so its groove slides over the adjacent tongue. ✓ Continue adding boards to the run, straightening the board as you nail until you reach a position where you have to cut the next board to fit. ✓ Cut and nail this board in place. ✓ Stay at this end and continue nailing and straightening the boards as you have been doing it previously. Continue until you have almost reached the other side of the room. ✓ You will now find that you have a gap where you have to fit a board which is less than the width of a full board. Don’t panic! ✓ joins the body of the board as the tongue will be hidden within the groove. ✓ Transfer these dimensions to the face of the board and saw the board to remove the excess wood. You now have a length of board shaped to fit the gap (it will usually be wedge shaped). ✓ Face-nail the board in place. ✓ Continue with the next board, cutting it to size and nailing it in place until you have completed the entire ceiling. ✓ Starting in a corner of the room, mitre one end of the trim so it fits snugly in the corner. ✓ Nail the length of trim to cover the joint between the ceiling and wall. ✓ Continue adding lengths of trim making sure to cut internal mitres when you reach the corners of the room. ✓Stand back and look at the pattern of the boards on the ceiling. With any luck and if you have been following the instructions properly you will notice that none of the boards have a cut joint adjacent to another. Another way of putting it is to stay that all the joints have been staggered. This is how it should be. ✓You will also notice that the tongue and groove joints are all perfectly straight even though most of the boards were bent. So far we have talked about doing the job yourself and have given you instructions on how to go about doing it to a satisfactory level. Even if you intend hiring a professional to do the job, you still need to have an understanding of the problems a contractor would face so it wouldn’t hurt to re-read the instructions given just to appreciate how difficult the job would be to do properly. A carpenter. A person with these skills would be ideal. They would know how to level the ceiling if it is too lumpy prior to installing the boards and would know all the tricks of the trade to make sure the joints and mitres are perfect. A carpenter will be licenced and insured and would probably be able to do this job in half the time that it would take you to do it. A handyman. Although a handyman would probably be able to do this job, the level of expertise would not be as good as a carpenter. It would be like having a competent DIY person in your home to do the work. They should be insured but probably won’t be licensed as a carpenter. The costs would be correspondingly less than a carpenter. We will talk about the pros and cons of using a contractor or DIY later. Can the job be done as DIY project? Yes, fitting tongue and groove boards to a ceiling is very easily done as a DIY project. There are a few things you should be aware of which if you are a competent DIY enthusiast you already know about. If you are relatively new to the hobby, then we will list them here. ✓ Use a saw properly. Make sure you can use a saw and cut in a straight line. ✓ Measure twice and cut once. Always check your measurements before you put the saw anywhere near the wood. ✓ Use a pencil. Keep a sharp pencil nearby with which to make measurement marks on the boards. If you tend to lose things like that then keep it in your back pocket or lodge it behind your ear for safekeeping. ✓ Don’t hammer your thumbnail. When using a manual hammer to drive the nails, be careful that you don’t miss the nail head and hit your thumb or the board. Your thumb will become bruised and the board will start to show circular indentations around where the nail should be. Try using a nail punch to drive the nail head below the surface of the wood. ✓ Know your units. When reading measurements from your tape measure, make sure you understand the units in which you are working. Most tape measures show units in metric (metres, centimetres and millimetres) and imperial (yards, feet and inches). Choose a measurement system you feel happy with and stick with it. ✓ Use a saw bench. Either construct a purpose made saw bench so you can rest on something the correct height when you cut wood or buy a proprietary one such as a ‘Workmate’. Never use tables or chairs to rest the wood on when you are cutting it. ✓ Clear the room. You will be working above your head for a lot of the time and will probably forget to look where you are walking. Make sure you clear the room as much as you can so there are fewer things lying around for you to trip over. What are advantages and disadvantages of doing the job yourself? As stated elsewhere in this article, it is possible to do this job yourself or by hiring a contractor. The best contractor to use would be either a carpenter or a handyman, depending on your budget. Remember that carpenters will be properly trained in woodworking skills whereas a handyman may be trained in one of the other construction skills such as plumbing or electrical work. There again you may get lucky and find a handyman who is a carpenter anyway. The job will cost far less than when you hire a contractor. All you need to do is find the cost of the materials. If you can cope with the upheaval of having a room half finished, you can take your time and spread the work over a number of weekends. You will not have complete strangers in your home. Although you won’t have guarantees to cover the quality of labour, you will be able to get your money back from the retailer if the wood is unsuitable or of too poor quality. You may have to learn new skills or use new tools, which may or may not be a problem. 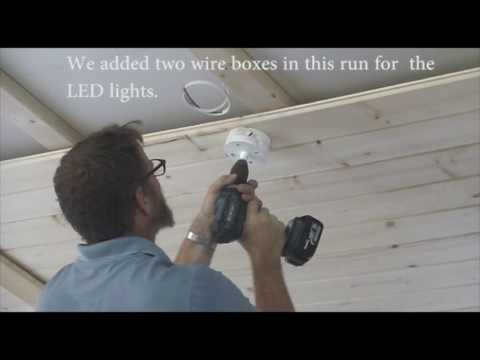 You may not be happy about doing basic electrical work if there is a ceiling light fixture to incorporate into the job. The contractor will be experienced in the carpentry skills needed to produce a good job. The contractor will have all the required tools needed. A skilled professional will carry out the work quickly and efficiently. The work will be of a good quality and there will be a minimum of mess. The contractor will be able to give advice on design problems that you probably didn’t even think about. A contractor will provide guarantees for labour and materials. If anything goes wrong, you can be assured that the contractor will be able to put things right. A contractor will be able to prepare your ceiling better than you if the surface is not level. Whether you hire a carpenter or a handyman won’t really matter except for the cost. Handyman labour rates tend to be less expensive than carpenter’s rates. What is vitally important is to make sure the contractor holds the necessary insurance. The contractor needs insurance to cover damage to your property. He needs insurance to cover injury and death to you, your family or the general public. His work team must be covered by worker’s compensation insurance in case of any injury or fatality. If you decide to do the work as a DIY project, ask your local building control office or the permit office if all the work you are intending to do can be done as DIY. Contact your home insurance company to find out if your cover or any premiums are jeopardised by doing the work as a DIY project. Finished ceiling area. Obviously the size of the ceiling will directly affect the amount of tongue and groove you buy. Not only that but it will also affect the amount of varnish or paint bought and the labour needed to apply this. The quality of the material chosen. The grades of timber used can range from the cheapest or economy grade softwood with knots and splits (‘splits’ are known in the trade as ‘shakes’ and include other imperfections as well as splits) up to the best quality and most expensive hardwood. The type of labour. Whether you are going to clad your ceiling as a DIY project, use an unlicenced handyman, a licenced and bonded contractor or a building and design company. Ceiling shape. The shape of the ceiling will have a big effect on the costs. At the very simplest the ceiling will be a simple rectangle, a room shaped as a ‘L’ or ‘U’ with up to eight corners and as the most complex a room with more than ten corners. Surface finish. If the economy surface is to be painted with the usual sequence of paint; primer, fill, first coat and top coat, then this will be a different job to a better quality surface finish of sand and seal. The extra time taken with applying many coats of paint will be counteracted with the longer preparation time needed with good quality sand and seal. Adding battens to the ceiling before installing the boards. This could take place if the ceiling was not level or if you wanted to insert acoustic or thermal insulation between the boards and the existing ceiling. Any electrical work. Most rooms have at least one electric light hanging from the ceiling. If you are intending to fit boards then the light fitting will need to be removed and replaced after the carpentry work has been done. Painting and decorating. The new tongue and grooves will require sealing after installation. The surface can be sealed by using varnish or by using paint. The choice is up to you. Extractor fans and air vents. The original ceiling may have air conditioning vents or extractor fans, especially if the room is a kitchen or a bathroom. Moving these or cutting the boards around these will need to be accommodated in the budget. Demolition. Depending on the condition of the original ceiling it may have to be taken down and removed before the boards are fitted. Once the original ceiling has been removed it would be worthwhile inspecting the joists, any electrical wiring and any plumbing that may be hidden within the ceiling and repairing or replacing them if needed. Do you have problems with sound transmission between the downstairs and upstairs? If so then consider inserting acoustic insulation between the joists. Asbestos? If the original ceiling is made from asbestos tiles or old Artex then there will be asbestos present. If so then the asbestos will have to be removed and disposed of by a specialist company who will dump the material in accordance with local and national environmental legislation. The cost to install tongue and groove boards on your ceiling will vary as explained elsewhere in this article. Additional variations in cost will depend on where you buy the materials and whether the timber is economy grade or not. If we take three cases varying the ceiling area, grade of material, type of labour and ceiling shape we can see how the prices will vary. Please bear in mind that these costs are approximate and will vary depending on where you live, whether the tongue and groove has been bought from a retail outlet or direct from a sawmill and the experience of the contractor. The labour costs shown do not take into account the cost of any permits, costs of demolition, repair or any structural modifications. They do include the costs of setup, fabrication on site, installation and clean-up. The supplies costs include consumables for preparation and fabrication and rental allowance for professional installation tools. When you are dealing with contractors it is always worthwhile to let them know who the boss is. That’s not to say that you should lay down the law and not take any advice, that would be stupid. Don’t forget the contractor knows his job better than you do and has probably had far more experience at making something look good too. What we meant by being the boss is that you should not be afraid of asking pertinent questions regarding the contractor’s insurance and license situation, amongst others. An experienced, licensed contractor will answer all questions you put to him and settle any concerns you might have. Always get quotations from the contractor, in writing, detailing the following points. Scope of works. This is a list of all the work you want the contractor to do for the money you are paying him. Material specifications. This will be a list of the materials you intend using including the specifications of the wood. It is very important to get this finalised at this stage so that you don’t end up paying for premium quality softwood but actually receiving economy quality. Without having sight of a printed label detailing the quality and specifications it can be very easy for an unscrupulous contractor to pocket the difference in cost. Deadlines. This will be a list of start date, duration of the job and end date. If the contractor can give you a few different options of when the work could happen it would be better because there is no guarantee that the first date will be convenient. Payment due. You will need to know when the contractor is expecting you to pay for the work. Normally the work should be paid for on satisfactory completion, after having been checked by the customer. In certain circumstances the payment schedule may be different from this and we will touch on these alternative scenarios now. If the job has a particularly large scope of works and is expected to last for more than a month then it is acceptable for the contractor to ask for and receive a deposit, usually no more than 10% of the total value of the job. This shows the contractor that you have the commitment to pay for the entire job on completion. If the job is expected to last for more than a month and includes a number of separate stages then it is acceptable for the contractor to ask for a deposit at the start of the job, followed by stage payments due when the work has reached a certain level and the agreed tasks have been completed. The balance would be payable on completion of the job. If the job uses a lot of materials that can be considered as expensive, it is acceptable for the contractor to ask for the cost of the materials (or a percentage of the cost) when they arrive on site. This releases the contractor from having the responsibility of paying for the materials upfront and having them left on your property. This arrangement works in both parties’ favour as the contractor doesn’t have to worry about the customer deciding not to pay after the materials have been used. If that happens the contractor has only lost the value of his labour. The customer has the comfort of knowing that the correct materials are being used, are available on site at all times and belong to the customer rather than the contractor. How to expedite changes to the contract. No matter how well a construction job is planned, there is always the possibility that something will happen that was unforeseen by the customer or the contractor. For example let us say that in the original contract there was no provision for doing any work on the ceiling joists, why would there be? When the original ceiling covering has been removed we find that some of the joists are rotten and need repair and replacement. Obviously the work will have to be done before the tongue and groove is installed so how are we going to remedy the problem? The way to sort the problem is to agree between both parties that any extra work will take place at an agreed hourly rate. Photographs can be taken as proof before and after repair in case the customer is at work and not available for authorisation. However you agree to sort the problem, it must be specified in the contract and agreed by both the contractor and the customer. Photographic log. Agree with the contractor that he will take photographs of all jobs at certain stages. This can be useful at a later date if there is a dispute between the customer and contractor. It can also be useful in case the insurance company needs proof of a certain operation taking place. Often many jobs that are essential to the final product become covered up and hidden with no proof that they ever took place. Using photos and a daily diary the contractor will have proof that he has done a job and can be paid for it while the customer will have proof that corners haven’t been cut to save the contractor time. Insurance. The contractor must specify his insurance policy details and prove the things for which he has cover. He must have cover for damage to your property, cover for injury and fatality and cover for injury to his own workforce. Certification. The contractor should attach a copy of his contractor licence proving that he is properly registered. The customer must be able to have the opportunity to check all details on the licence. What to look for to spot a scam? Unfortunately there are unscrupulous people in all walks of life and the construction industry is no different to any other. Most of the scams that are commonly perpetrated are general to all the construction industry but can be varied to suit the specific job in question. Cost. We have already talked about the various costs that should be expected when installing a tongue and groove ceiling so you must be aware of these when you are dealing with the contractor. Be careful of the person who will try to overcharge you because you live in an expensive area or you look wealthy. If you are in any doubt as to the cost of materials, ask the contractor what the specifications are and ask your local construction materials retailer for a quotation to supply. Remember however that it is acceptable for the contractor to add a percentage onto the cost of materials to cover his time and trouble organising it. When you agree a price get it in writing and ask for the specifications so you can independently check the price. Don’t feel uncomfortable. When dealing with a contractor or in fact when dealing with anyone who wants some of your money, pay attention to your intuition. Remember that you are allowing a complete stranger into your home for days or maybe weeks at a time. The contractor might be in your home on his own or you might be there alone with him. It is very easy for an unscrupulous person to bully and intimidate a vulnerable person into handing over money or allowing them to search your home. Remember there are always more trustworthy companies around with whom you may feel more comfortable. Fake Insurance. Don’t be content with just being told that the contractor is insured, ask for a photocopy of his policies and check out the details yourself with the insurance company. You need to know that the policies will be valid at the time the work starts and for the duration of the job. Fake address. In your initial search when finding suitable contractors make sure they have a real address and that they are who they say they are. If possible, physically visit the address without warning to check that everything is at it should be. Ask at the office of your local building control inspector, they will probably be able to tell you if the contractor is genuine or not. Use Google. Just about everyone has some access to the internet so use it. Find out as much as you can about the contractor. Look on local forums and social media to see whether the contractor is the subject of discussion. Correct materials. One of the biggest scams that contractors use is to buy the cheapest economy grade materials and charge the customer for more expensive better quality materials. They may even be using materials that are substandard and not suitable for the job. Always work with reputable and respected local or national construction companies or contractors. Never with ‘fly-by-nights’. Paying by cash. Be wary of anyone who insists on being paid by cash. If you are paying for materials or a deposit always pay by bank transfer or by cheque never by cash. And when you do pay, always make the order payable to the company name; there are many stories of customers being asked to make the money order payable to the contractor’s wife or husband. Stick to doing things by the book and you will know that if there is a problem later on in the job, you will have a paper trail that attorneys can follow in your favour. One-day-wonders. One of the classic hustles involves a person setting up a supposedly respectable construction company, solicits business from gullible customers, is paid a deposit or a sizable proportion of the total cost, does a poor quality job and never comes back to finish the work. The company closes down and the contractor opens up another company doing the same scam. Unlicensed contractor. People always make the mistake of assuming that using an unlicensed contractor will be cheaper than a licensed one. Unfortunately if you stop and think about it for a moment you will realise that they are probably unlicensed for a reason. Are they dependable? Are they able to carry out the work to a suitable standard? Are all their income tax payments properly submitted? Do they use quality materials? Do they offer a guarantee that they can honour? Have they been arrested for fraud? Many of the unlicensed contractors move around a lot and are never in one area long enough to settle down and gain a reputation. Today we have looked at the costs associated with installing tongue and groove wood ceilings. There are many different factors which have an influence on the total cost to the customer and we have looked at these. We have explained what steps are involved in actually doing the job so that you can see what problems might be encountered by the contractor. If you want to save money you can even do the job yourself using the step by step instructions supplied. We hope you have found some new information in today’s article or if not, then we hope you have found a different way of looking at things. Whatever your experience was, we hope it was positive and I thank you for reading.